You should let Wotif organise your foray to Kuta for you. Simply pick from any of the 323 available hotels, all of which are just 2 kilometres from the middle of town. 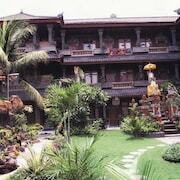 The Villa de daun and The Sandi Phala are the most central hotels in Kuta. 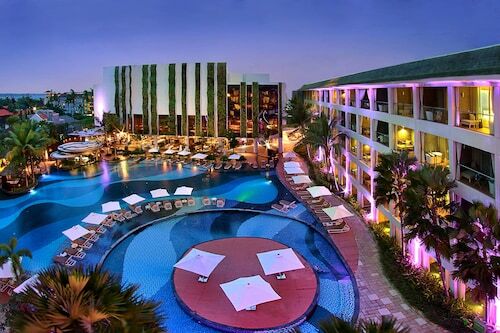 If they don't interest you, the Padma Resort Legian and the Sheraton Bali Kuta Resort might be a better fit. Tuban, which is found only 3 kilometres from the heart of the city, is a favoured suburb with 21 places to stay. Investigate the amenities available in Green Villas Hotel and Spa Bali and ViHan Suites. If you are spending time in Kuta to see Tuban Beach, Legian Beach or Seminyak Square, you may like to stay nearby. 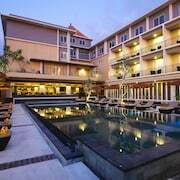 Hotels close to Tuban Beach include the Discovery Kartika Plaza Hotel and the Hard Rock Hotel Bali. The Discovery Kartika Plaza Hotel is 0.6 kilometres from Tuban Beach, while the Hard Rock Hotel Bali is situated 0.6 kilometres away. 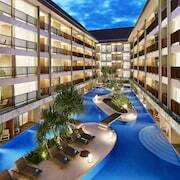 The Legian, Bali is located 2 kilometres away from Legian Beach. 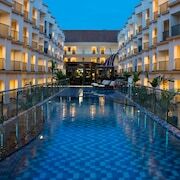 The Peppers Seminyak is also within an easy walking distance. 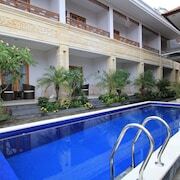 However, the Bale Gede Villas as well as The Samaya Seminyak are handy if you choose to stay near Seminyak Square. The Bale Gede Villas is just 2 kilometres away and The Samaya Seminyak is 0.4 kilometres away. Grab your hat, thongs and towel, and head out to Segara Beach for some fun in the sun. 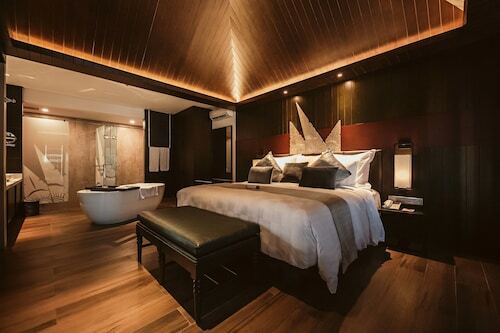 If you're interested in this attraction and would like to stay in it's vicinity, take a look at Marriott's Autograph Collection, The Stones Hotel, Bali and 18 Suite Villa Loft by AMITHYA. If you've got some cash stashed away, visit Discovery Shopping Mall to purchase everything you need as well as a few luxuries! Stay at Beautiful Bali Villas and Anema Villa Seminyak and you can stop by this hotspot everyday. If you're flying into or out of Ngurah Rai International Airport and looking to stay nearby, try the Four Seasons Resort Bali at Jimbaran Bay or the Temple Hill Residence Villa. Need insider tips on must-see attractions in Kuta? Check out our Kuta travel guide! 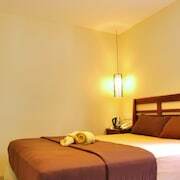 How Much is a Hotel Room in Kuta? 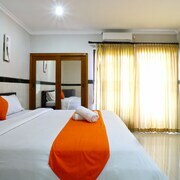 Hotels in Kuta start at AU$20 per night. Prices and availability subject to change. Additional terms may apply. Best value for money in Kuta. Lots of bacon for breakfast and hard working staff. Modern feel to this spotless property. Luxurious bathroom and plenty of space for 3 of us in the room. Lovely breakfast and complimentary airport transfer. Convenient to Lippo and Discovery Malls and Waterbom park too.